The new Breville has a new non stick ceramic coating which is extremely tough and cleans very easily. Duraceramic is free from chemicals like PTFE and PFOA which are common in the manufacture of non-stick saucepans but can chip and flake off. As with the previous V104 series the bowl can tilt, for even cooking of things like chips which are able to tumble as the bowl rotates. The VDF122 is able to saute, roast, Fry, grill and bake. It recommends just half a tablespoon of oil to cook 1 kg of chips cut from fresh potatoes, or with the frozen variety zero oil. This model offers grill only or grille and oven heating. For fish, steaks, sausages and bacon the grill only mode gives the best results. The VDF122 has a hinged lid which is great from a safety point of view. The pan is dishwasher safe and the lid can be detached simply using the buttons on the hinge part to release it. The manual is unusually detailed with several good recipes in it. After many gripes at poor instructions this is a breath of fresh air. I’d been looking for an air fryer to try for a while, chose this and I’m so glad I did! I love it, im still experimenting at the moment with what it can do, but so far so good! The tilting mechanism is great, ensures really even cooking. I’ve not perfected chips just yet but that’s down to me, not the product, they are already much nicer than any frozen or oven cooked versions! Lovely mini roasts/new potatoes etc and loads of things this can be used for. This is a great product. I live alone and using the oven sometimes feels like an overkill if you know what I mean. This does the same job much faster. It is important to understand why these are usefull, you can make the same healty stuff with an oven. 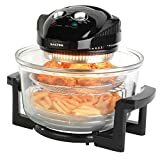 Oven takes longer time but can cook or bake much more stuff at once, this can do less but if you live alone it is all you need then get one of these. My old (cheap) air fryer broke so decided to purchase this rather than simply replace. It’s great at doing chips and other foods that can tumbled, ensuring that they are cooked all over, although I find that the cooking times are a bit longer with this (pretty much reflecting the oven cook guide times, whilst the old air frier was considerably quicker). Cleaning the ‘basket’ is really easy and operating the machine is simple – and it looks great on the worktop and whilst turning/tumbling the food. The only negative really is that it doesn’t feel as versatile as my old frier, especially with the central spoke getting in the way – although saying that there are many things you can cook in this that a frier cannot do as this can work as a saucepan as well as a frier. This is an amazing product superior to any other health fryer. It is very versatile and quality of materials and finish is also superior but to me the best is the way how moves the food while frying to get them perfectly and homogeneously fried around. Clever design!!!! I do not stop using it!